Does your social presence represent you in the right way? Recruiters use social media to find top talent. A professional, business-appropriate photo. Profiles with photos are 14 times more likely to be viewed. A descriptive summary to highlight your expertise and passions. Don’t just rehash your resume. Use keywords relevant to the skills employers would look for in the industries and jobs you are interested in. Quantifiable accomplishments and specific responsibilities. Employers may be reluctant to hire candidates with little or no social presence. Make sure your personal profiles are not set to private. According to CareerBuilder, more than one-third of employers cite lack of online profiles as a “red flag.” You want to have a presence, but be discerning about how you engage on social networks. If it makes sense, create a new account and start with a fresh canvas. Everything you put online stays there -- where recruiters may find it. Recruiters often search out recommendations to support what your profiles reveal. Ask for references from your LinkedIn connections. It’s helpful to see what others think about the work you’ve done for them. Make sure it represents you the way you intend. If not, ask the writer to revise it before it goes public. It’s also helpful to recruiters to read recommendations you have written for others. It provides insight into your character and can help them determine if you would fit in with the company. Recruiters routinely scout LinkedIn industry groups and blogs. How are you interacting on social platforms? Have you joined any LinkedIn Groups or association forums? Now is the time. Get in the conversation, ask questions and share information that may interest people in these groups. Show and share your expertise by blogging on dedicated industry sites or social network homepages. It can help build your credibility and personal brand and may catch the eye of recruiters who are also part of the group. Follow companies and industry influencers. Keep track of what is going on at the companies you are interested in. 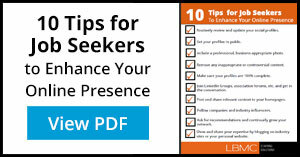 Whether you are actively job searching or not, these strategies will help you present a competent, respected and professional online presence.